SlimWall fence panels can be easily customised with slats and custom infills which provide a stylish, designer finish to your fence. These can provide the look of extra height and visual security without being imposing. Please note that SlimWall does not manufacture or sell slats or infills. We can provide you an approximate price guide, or for assistance locating a local supplier, please feel free to contact our customer service team. The addition of lighting to your wall creates a stunning visual effect. It is also a practical choice to light footpaths, driveways or to define an entrance. 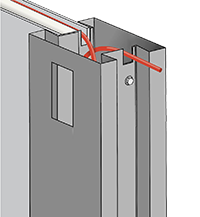 All of our composite wall panels are internally recessed to accept cabling that is then looped though the post. Any face fixed external light is generally suitable to be mounted directly onto the post face. Create a stunning linear look by using our expressed panel joint option. Providing a 10mm recessed joint in-between any upper and lower panels this gives a very modern architectural look. As seen here we have used 3 x 600mm panels to create an overall fence height of 1.8m which provides a double row of joints but for a single row 2 x 900mm panels can be used. When used as a front boundary wall you may need to incorporate a letter box into your design. The AcoustiMax wall panel can accept a typical recessed style of letterbox that will protrude out the back of the panel or alternatively a face fix unit that can be seen here.